The easiest, creamiest, rice pudding recipe! Our rice pudding takes just under 30 minutes to make and is one of the best, most comforting desserts, ever! 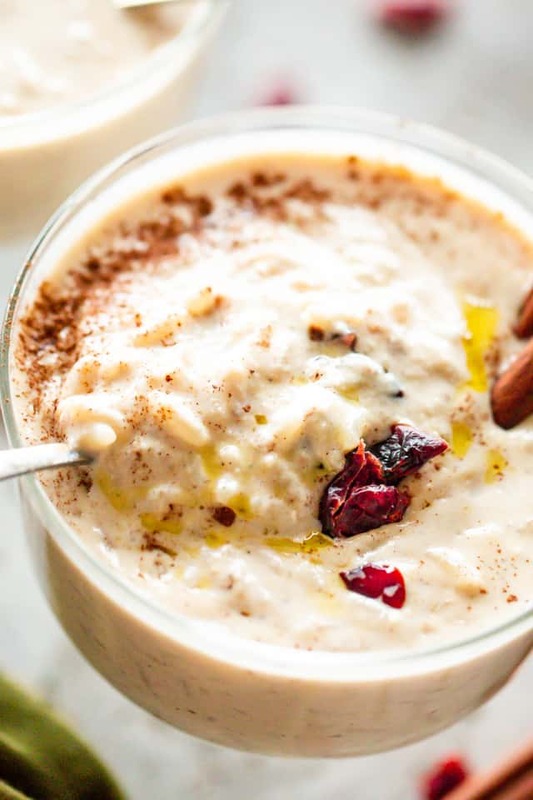 This cinnamon-y, craisins packed Rice Pudding is very easy to make and turns out so rich and tasty! With just a few ingredients, this wonderful dessert is great served either warm or cold. I, once again, woke up with a sweet tooth. Never ending story. BUT, I need to get back to good-eats because bits of the last month’s Christmas Feast can be found on my hips, cheeks, and flabs – ahem – abs. That food was so good, though – worth all those extra calories, carbs, fats…! SIDENOTE: This post and recipe were originally posted on January 10, 2011 – updated with new pics on January 23rd, 2019! WOW! I can’t believe I’ve had Diethood for this long! WOOOOT! Okay, back to what I was saying back in 2011 👉 Have I told you that I love Rice Pudding? I DO! I grew up on this stuff, and we call it Sutlijach in Macedonian. That’s soot-lee-yatch. It was a weekend treat and my mom would make tons of it because my sister hated milk, but she loved it in desserts because, creamy. There are many variations for this dessert, but mine – actually, my Mom’s – version is pretty straight forward and like, stupid easy. To start, we only need rice, milk, and a bit of salt. 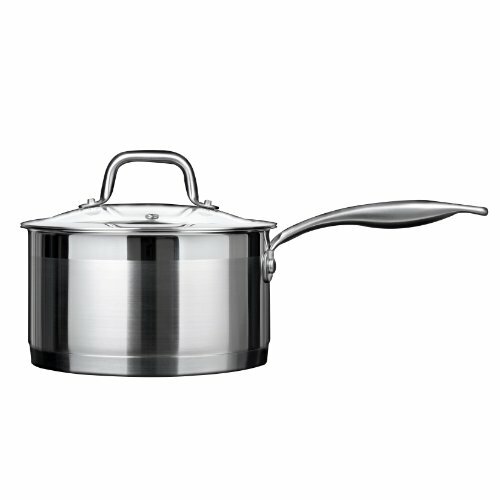 Plus a saucepan or soup pot. Combine all those 3 together in the pot and bring to a boil; reduce heat and continue to cook for 20 minutes. In a small mixing bowl whisk together light brown sugar with an egg. Scoop out 1/3 cup of the cooked rice pudding and whisk into the egg mixture, 1 tablespoon at a time. 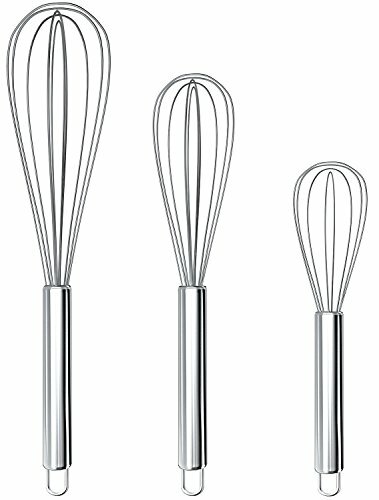 DO NOT stop whisking or you’ll end up with scrambled eggs. Whisk the entire brown sugar mixture back into the pot and continue to cook over low heat for 5 more minutes, or until thickened. Stir in some vanilla, cinnamon, a bit of nutmeg, and a nice dose of craisins. Or raisins. Or none of the above. But you SHOULD because that is what makes this rice pudding extra special. Rich, creamy, and almost no work, this creamy rice pudding is wonderful and everyone that’s tried it, loved it. Our rice pudding takes just under 30 minutes to make and is one of the best, most comforting desserts, ever! Combine milk, rice, and salt in a large saucepan or a soup pot. Bring mixture to a boil; reduce heat to LOW and simmer for 20 minutes, or until the rice is cooked and tender. Make sure to stir it every once in a while so to prevent the rice from sticking to the pan. In a separate mixing bowl whisk together brown sugar and egg. Whisk the entire brown sugar mixture back into the pot; whisk in cinnamon, nutmeg, and vanilla, and continue to cook over low heat for 5 to 7 more minutes, or until thickened. Remove from heat and stir in the craisins. Serve warm or cold with a sprinkle of cinnamon on top. Looks great will definitely try it. Question: I find it unusual to use long grain rice rather than short/medium. Do we have to use long? We usually have basmati in the pantry not regular long grain. I would guess that would alter the flavour? Oh yeah, you can definitely use shorter grain rice. If you want to use Basmati, that’s up to you – it will alter the flavor somewhat, but if you like it, I don’t think it should be a big deal. Could you sub 1 can full fat coconut milk for part of the almond milk. We generally don’t eat white rice so I wonder if you could sub brown rice or sprouted brown rice and maple sugar granules for the br. sugar. So, I would definitely go ahead and give it a try with your ideas. 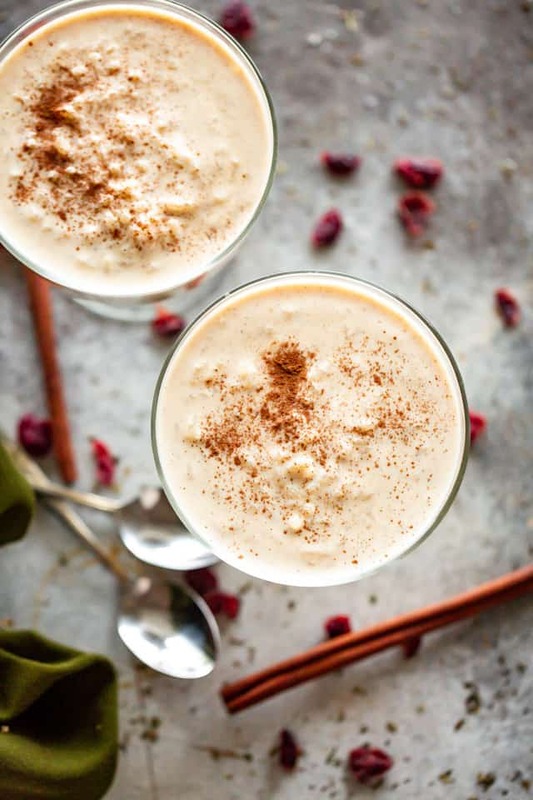 The coconut milk – I can’t say 100% that it will work because I’ve never tried it, but I don’t see why it wouldn’t work… and it sounds like it would be so delicious! Also, yeah, use brown rice, but you may or may not need to cook it a bit longer. I would just try a grain after 20 minutes of cooking to make sure it’s tender. 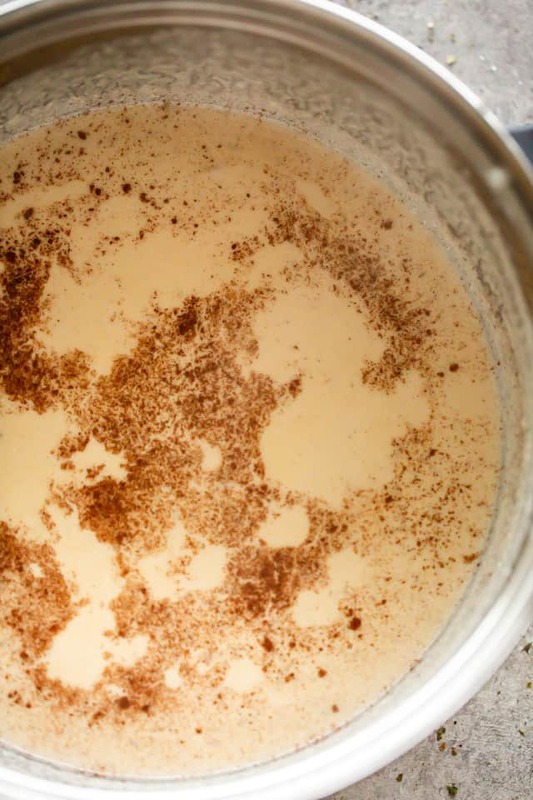 Also, about the maple sugar granules – you’ll want to make sure that it’s all completely dissolved before removing the rice pudding from the heat. I wonder if you could you use vanilla almond milk? Hi Katie! I’ve never tried that, but I don’t see why not… just watch it closely in case it may need more or less milk. Let me know how it goes! I tried this recipe but used sugar free almond milk…..was very creamy and yummy!!!! You have so many comments, jealous sigh 🙂 My gma makes rice pudding EVERY year for Christmas and I absolutely love it. Except hers is made with full fat cream, so not quite diet friendly! Mmmm I love the addition of rum to this! I wouldn’t have thought of that! I hardly eat sweetened rice, but a pudding like this is simply irresistible! 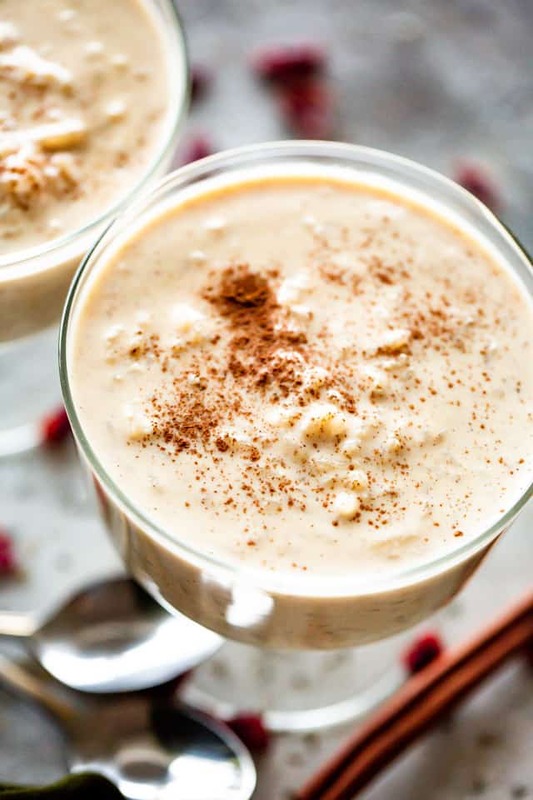 Oh my mom used to make us rice pudding when we were little–what memories it brings back! I’m making this for my daughter! She’ll love it! It brings back happy memories for me. My mom used to make this dessert for us too. I want to make this. I love the addition of rum! I love rice pudding! Yours sounds heavenly with the addition of the rum! Rice pudding is one of my favorite breakfasts. Who cares if it’s a pudding…it has grain and raisins, eggs and milk. It is perfect breakfast food. Yours look beautiful in those sundae glasses. Fantastic recipe, looks delicious and very healthy! This looks delish! And yes, I can relate to the post-holiday flab. Sigh! Yum! 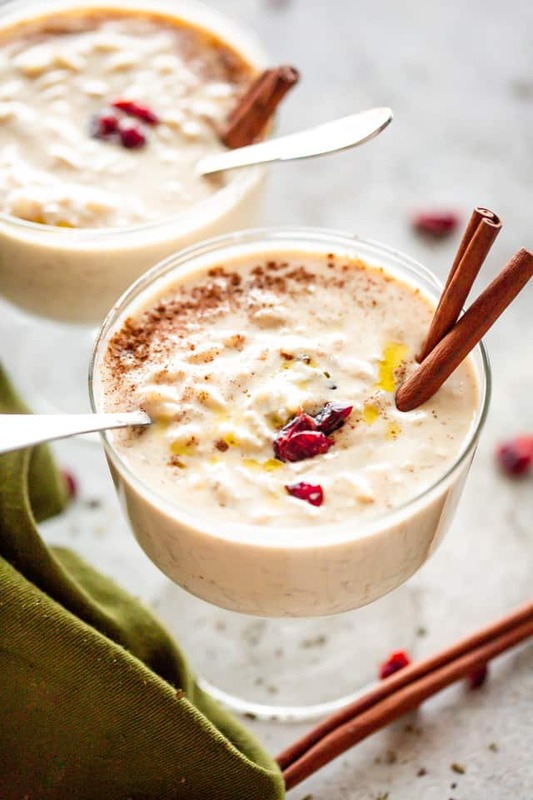 I love rice pudding and I love that this recipe is so healthy too. Thanks for sharing! This truly looks delicious! Could one possibly use Agave nectar in this instead of Splenda? I just bought some and am experimenting with it. Lovely photographs! I think agave would be great in this! Like many others, it has been forever since I have had rice pudding. I wish I had some now. I am totally craving a dessert and I didn’t bake anything sweet these past few days! 🙁 Hang in there… hopefully this stuff will melt soon. We have high hopes of leaving the house very soon! your photos are wonderful as usual. This time of year definitely calls for a healthy dessert! Your rice pudding looks delicious and guilt-free 🙂 I’m imagining the flavors of the rum and golden raisins, mmm. I love that you posted a rice pudding recipe too! The crock pot batch I whipped up is gone, and I am ready for more LOL. I like the addition of golden raisens and liquor. I can’t do artificial sweetners or soy b/c of the autoimmune disease, but I like the idea of skim milk. Looks so full of flavor, can’t wait to try it. Thanks for sharing! 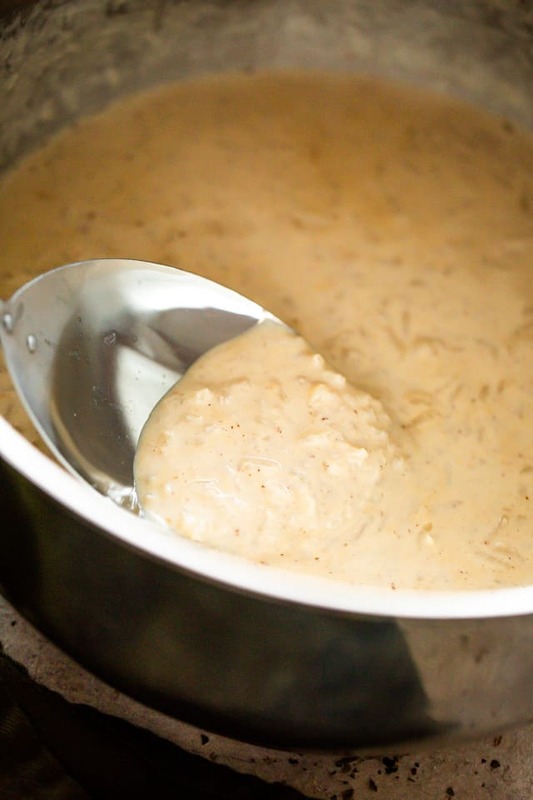 I can’t wait to try your crock pot rice pudding – it sounds soooo goooood! Excellent dessert that you don’t have to feel guilty about. 😉 Love it! This does look like such a delicious AND healthy dessert. We all need more of those, right? I imagine that the rum and the raisins impart so much flavor! Thank you for you for sharing this yumminess, and thank you for your kind words on my blog. They mean so much! Wow, it looks fantastic! We love to add a splash of rose water for a somehow oriental flavor. OMG love this! I seriously love rice pudding, but I’m the only one in the house who will eat it! This one I feel okay about making, not so fatty – sugary! Thanks for sharing! 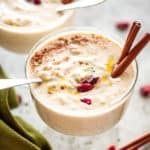 ooh this looks so good, and simple – i love rice pudding but have never made my own – but i may just have to try this….and share some with my mom since she is diabetic. I’m joining you in the ‘hood!! I actually went back to the gym today after a 2 month sabbatical and it felt pretty darn good. Vacation in the bikini is planned and I have 8 months… not that I’m counting down! I only need to lose 3 or 4 lbs, but I want everything tight again and still wanting a treat will make this dish a good one. Nicely done! Thankyou! This is a wonderful dessert – I have diabetic friends and I am always sratching my head as to what to serve and you come along with something delicious, pleasing to the eye and satisfying. Thank-you! I have never made rice pudding. I adore tapiocca and I am sure they are somewhat similiar. You have inspired me. Happy New Year!! I’ve never had rice pudding, but if it has rum in it I’m open to new ideas! Whoa! Rice Pudding…one of my favs…….all about comfy cuisine I am! Your presentation is beautiful and the recipe sounds delicious! Yum! I wonder if this would be good with coconut milk? It would have a strong coconut flavour… but I think it’d be good! I have never been a fan but boy after looking at your rice pudding I am sold on trying it again! looks fantastic! I too love rice pudding! One of my Dad’s favorites…I think I’ll make him some of your healthy version the next time I’m headed home to see him! I love rice pudding and can’t remember the last time I had it. My mom used to make it whenever she had rice left over from dinner. Such nice comfort food and a bonus that yours is a healthier version. Great recipe! I love healthy, sugar-free desserts and this is definitely a good one! Great job on this Kate! Sound healthier and it looks yummy especially with those beautiful raisins! Looks fantastic. Great photos as well. You’re making rice pudding, I am making bread pudding, it’s a pudding-type week, I guess! I love that you made rice pudding healthier! When I crave sweets its usually something thick rich and custard like. Ice cream is a big one but I can destroy some pudding too. I and my waistline thank you! I love rice pudding! There is a place in Hoboken (where my best friend lives) that is a rice pudding shop – just like an ice cream shop. It is SO good and I try to go there everytime I visit! Rice Pudding Shop?!? I’d love to go there! I love rice pudding and it’s been a really long time since I had some. And with raisins, it’s even yummier :). I love rice pudding and you never really see it anymore unless your at a diner! How sad, yours sounds delicious with those plump golden raisins, and using splenda is a wonderful idea!